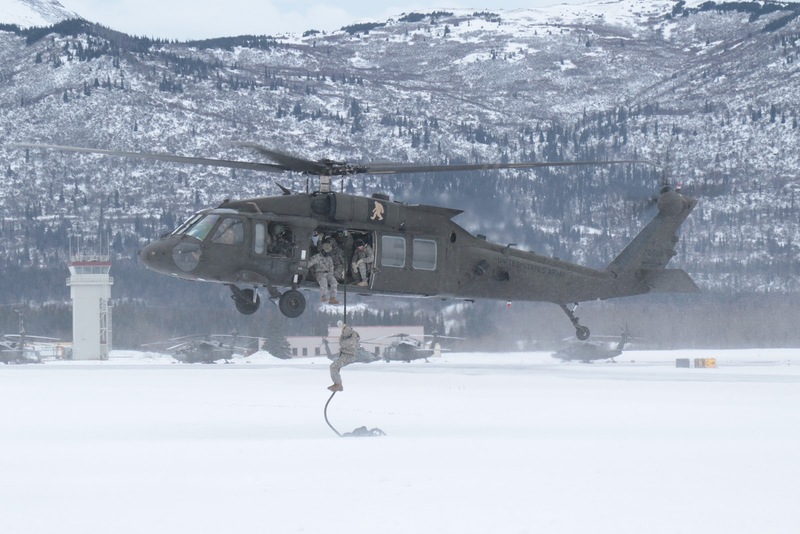 JOINT BASE ELMENDORF-RICHARDSON, Alaska (Jan. 16, 2019) - Soldiers from 1st Stryker Brigade Combat Team, U.S. Army Alaska, train USARAK and 4th Infantry Brigade Combat Team (Airborne) Soldiers on the Army Fast Rope Insertion/Extraction System at Bryant Army Airfield on Joint Base Elmendorf-Richardson (JBER). USARAK Soldiers conducted three FRIES descents from a UH60 Blackhawk helicopter in sub-freezing temperatures. Interesting. Maybe I haven't noticed it before but we're seeing fast roping at some really low levels lately. So low that it almost makes you wonder why do the training at all. Just taking a guess but I'd bet that isn't even 2nd story building tall. I wonder why? Is this another indication that the US military is becoming so risk averse that they're worried about the bumps, bruises and potential breaks from "training how you fight"? Let's be honest. If you're fast roping from this high up then the helicopter can either land or more likely get close enough for you to jump.